Happy Valentine's Day! Do you have plans for your Valentine's evening? We usually spend the time together as a family. I've got some family fun for you that is perfect for Valentine's or any night you want to spend with your family. I realize that most anyone that has children has had a family movie night, but as I've told you before we like cute things in our house. 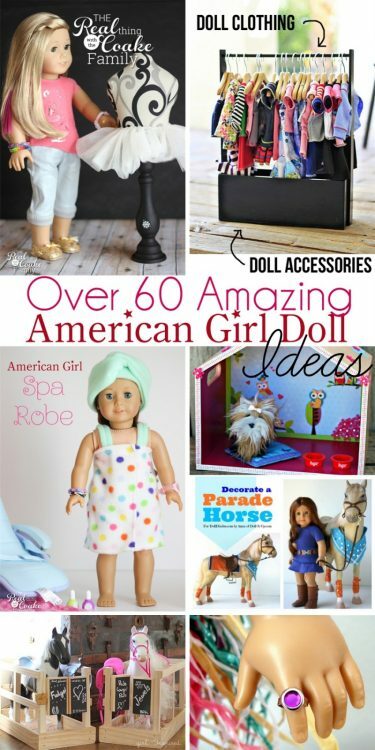 If I can take a few minutes and make something that adds to the fun, my girls LOVE it! First up, the printable pack has a sign to announce the moving playing for the evening. Print everything on cardstock and if you laminate your printables they will be super durable and you can use them many times. Laminating (affiliate link) isn't as pricey as you would think when you do it yourself. Also laminating the sign allows you use a dry erase pen to write the movie for this evening and erase it for use again in the future. Love that! I know we will have more than one family movie night, so laminating them saves paper and ink in the long run. 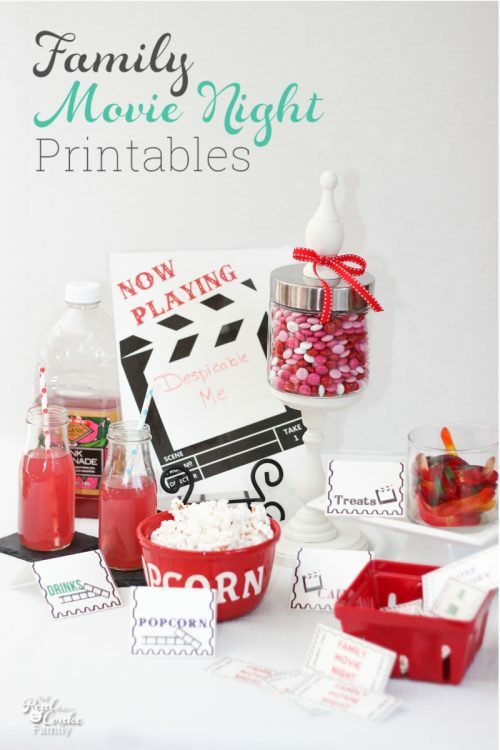 My movie night printable pack is also perfect to go with the cute Family Movie Night gift idea I shared with you. It just puts that gift over the top. Love it! 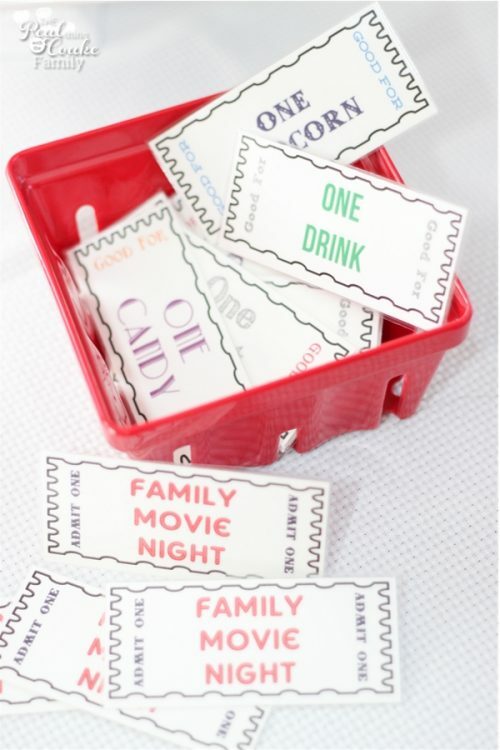 Included in the family fun movie night pack are tickets. There are tickets to get into the theater as well as tickets for the concession stand, otherwise known as the kitchen ;-). I did the tickets for popcorn, drink, candy, and treats. I know not everyone wants their kids to have candy, so I did the treat tickets. You can define what a treat is in your house and the ticket can go for that. I know it is obvious that this is a bowl of popcorn, but again, cuteness sells in my house. I have added tags for your concession stand. You can put out all the choices and have them labeled. That way your kids, or husbands, can figure out what they can turn their tickets in for. 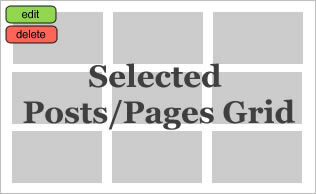 To make your tags, print them on cardstock. Make sure you fold them in half before you laminate them. That way once they are laminated, they will more easily fold like a tent and be able to label your food. 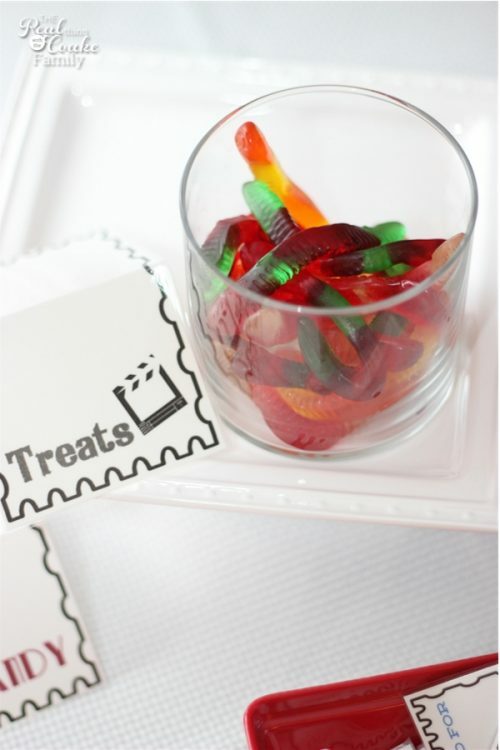 Normally, I would consider gummy worms a candy (and they aren't something we eat often), but I had them in the house for a school project and couldn't find anything else that would work for my definition of a treat…so this is what you get to see as a treat! What plans do you have for family fun tonight? Do tell…I love hearing your ideas! What a wonderful fun evening for a family. This is just ADORABLE! I kind of want to host a movie party now just because of these haha I love it, and it caught my eye at the ishouldbemoppingthefloor.com party–I had to stop by! Thank you, Cathy! 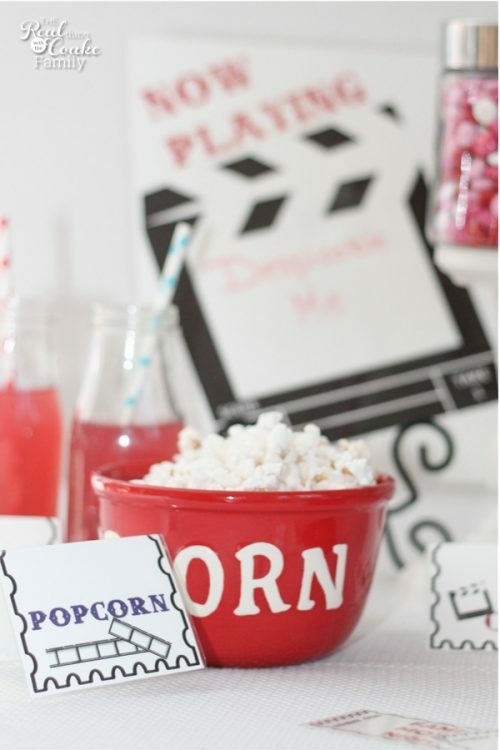 Hope you find time to host a movie party…sounds fun! 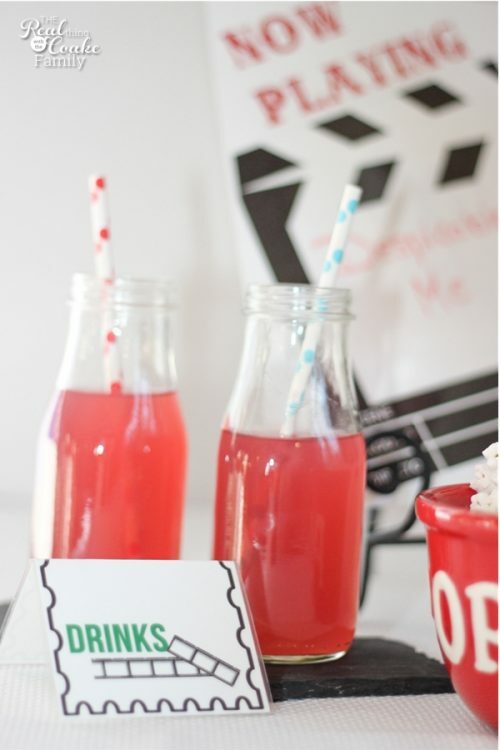 What an absolutely fabulous idea! I bet your whole family love all the effort you went through! 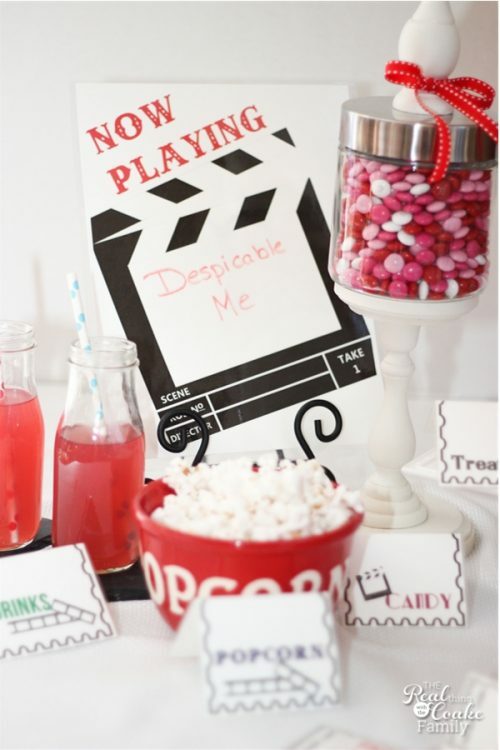 You made movie night… a night to remember! BTW~ great movie! Thanks so much for sharing your fun time with THE SCOOP!